In Ghana, prolonged dry seasons, irregular rainfall patterns and poor soil fertility are resulting in disastrous crop yields for many rural dwellers. The need for livelihood diversification has become crucial as communities are unable to survive on agriculture alone. 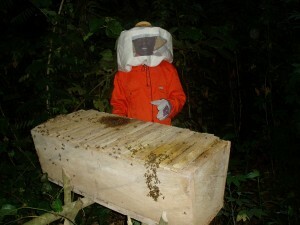 Beekeeping activities provide an essential income source in many rural West African communities. For the past four years, YOWE (Youth and Women Empowerment), a local Ghanaian community group and a partner of Village Aid, has been facilitating beekeeping in Eastern Ghana. Chelmorton Church in the Peak District has been the main funder of these activities, which are an important component of YOWE’s four year project ‘Securing rural livelihoods and strengthening human rights in Eastern Ghana’. Due to economic and social inequalities between men and women, it is particularly difficult for women to secure employment or generate their own income in rural Ghana. It is also increasingly difficult for poorly educated young people to secure employment and YOWE therefore works to enhance opportunities for women and youth. Over the past 12 months, fifty women and young people have been trained in bee keeping, honey harvesting and management of bee hives in Otrokper district, Eastern Ghana. Sixty bee hives have been constructed and installed in four communities. A beekeeping resource centre has been partly constructed and will be used to process honey, train farmers and for marketing and documentation. Land tenure systems can severely restrict women’s access to land. Despite this challenge, women are becoming increasingly involved in beekeeping and around 60 gallons of honey has been produced in the past twelve months, generating £1,850 from the sale of bee products. The systems for marketing honey and wax are becoming increasingly sustainable. Initially, bee products were transported to YOWE’s office and sold by staff members and the proceeds were then sent back to the community. 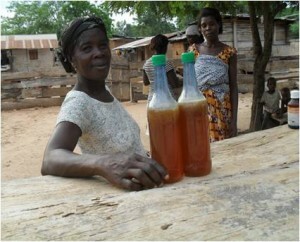 With YOWE’s help, however, bee keepers have been able to identify existing markets and now sell their products directly. They also investigate market prices, thus enabling them to sell more competitively. As a result, communities are becoming more independent and self-sustaining. As old bee hives become weak or are destroyed by bush fire, communities have responded by building 32 new hives. These have been installed at more suitable locations to avoid bush fire and minimise negative impacts on farming and other economic activities. 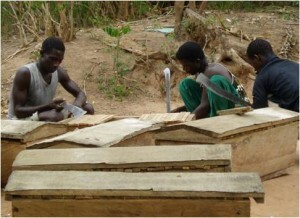 The community is also in the process of constructing additional hives at a new site. YOWE currently has two main aims: to enhance the positive impact of beekeeping on the lives of existing bee keepers and to engage more people in beekeeping. Currently, YOWE does not have sufficient funds to complete all necessary work as local Ghanaian funding is increasingly restricted to HIV/AIDS and local governance programmes. With further funding, YOWE hopes to provide refresher training to existing bee keepers to improve the effectiveness of their practices as well as train additional women and young people. The construction of the beekeeping resource centre also needs to be completed. The ceiling must be finished and sanitation facilities need to be constructed. Tables, chairs, electricity and computers are also required for financial record-keeping and would assist other activities such as research to support effective practices. We would like to say a huge ‘thank you’ on behalf of Village Aid, YOWE and, most crucially, the women, young people and communities whose lives have been significantly improved by funding from Chelmorton Church. NEXTVillage Aid Receives the EQM Award!